BATTLE GROUND — Statistics will tell you that Battle Ground is home to just under 21,000 people. But anyone who lives in the area knows that far more than that actually call Battle Ground home. So those people will likely be very interested to know what the quickly growing town hopes to grow up to be, and guiding that process has been the job of a 17-member group known as The Navigators. Building on feedback from a survey done online and at a number of Summer events, the group spent the past couple of months meeting with consultants to try and figure out what kind of city Battle Ground should be. The respondents to the survey overwhelmingly said they wanted Battle Ground to remain a place with a small town feel, access to outdoor recreation, and with family-friendly amenities and gathering areas. 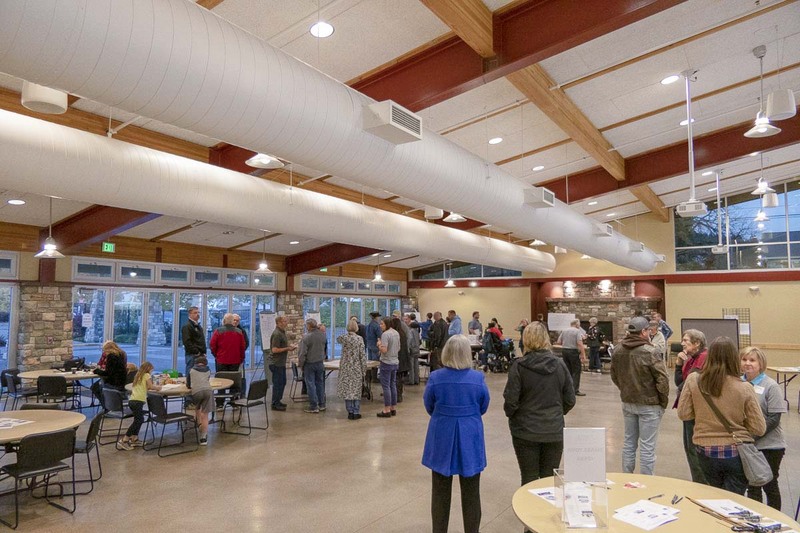 On Thursday afternoon, the public had their first chance to get a look at what The Navigators had done with their feedback, and to provide further advice and ideas, during an open house at the Community Center. Erin Erdman, Community Development director and acting Battle Ground city manager, said much of the feedback has centered around the concept of a connected community. 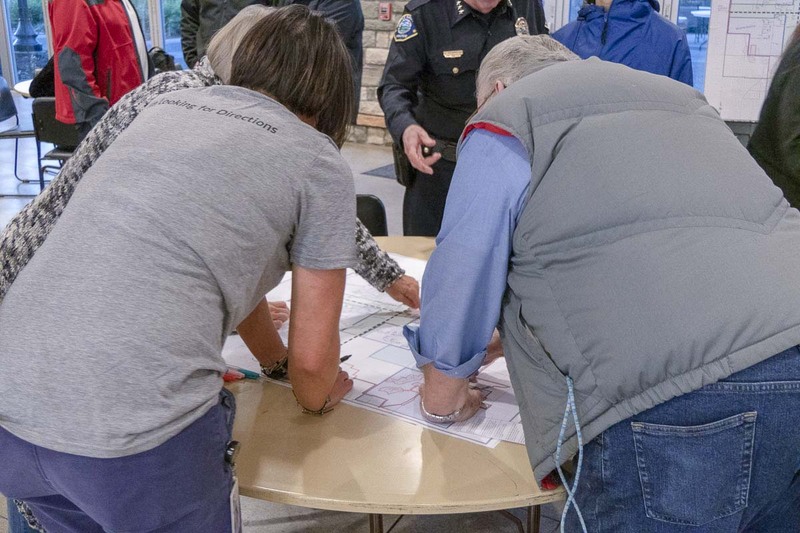 During the open house, citizens gathered around maps that showed potential areas for residential growth, a commercial corridor along SR-503 and then west along SR-502 out towards I-5, and industrial areas in the southeast part of town near Battle Ground Village. While residential growth continues in the northern part of the city, future growth will likely happen to the west along SR-502. 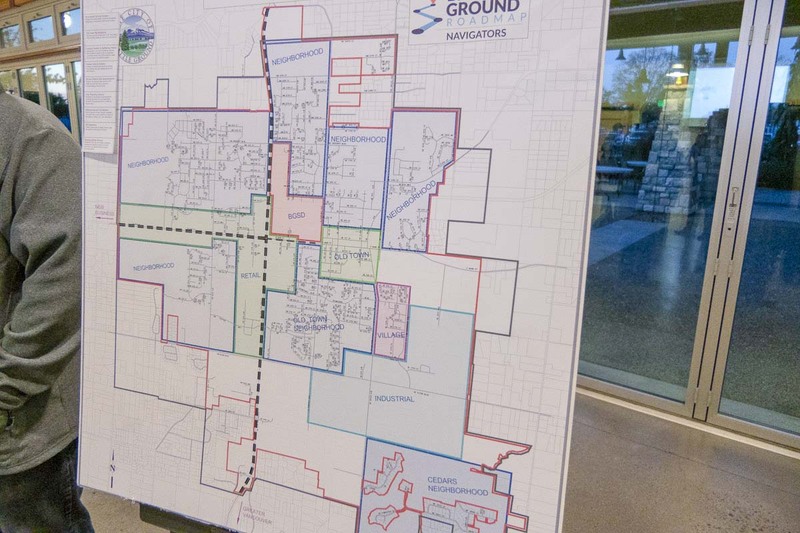 Battle Ground is hoping to annex more land that direction in future Urban Growth Plans. One of the primary “big ideas” presented by The Navigators group was Successful Schools. While everyone agreed it is important, the plan provides little guidance on what that would look like. Board President Ken Root agreed, saying even with the repeated failure of the district to get bond measures passed to replace overcrowding and aging schools in their southern area, they have tried to find ways to innovate. One example he cited was a recent career fair in which one company said they needed more people trained in auto body repair. The school district will also be instrumental down the road in potentially redeveloping a key piece of property at the center of Battle Ground. The 60-plus acre site is currently home to Battle Ground High School, Chief Umtuch Middle School, Captain Strong Primary, and the Lewisville Intermediate campus. Conversations with the city have been going on for at least the last year about that land eventually becoming a new city center for Battle Ground. Still, any development there would likely be at least a decade away. Ross points out that Battle Ground High School wouldn’t be eligible for state matching funds to build a new building until 2026. Meanwhile the district has more pressing matters to deal with. Meanwhile the district is in the midst of deciding how to address its overcrowding problem without new buildings, which will likely lead to a major shift in boundaries to help move students into less crowded schools in the central part of the district. Those decisions are likely to come by mid-January. Battle Ground resident Mike Robinson says he’s been keenly interested in The Navigator’s work. With a background in land use and urban planning, and a 41-year career in forestry, Robinson says he’s very aware of the delicate balance between the need to preserve natural areas, and yet accommodate enough growth to keep a city alive. 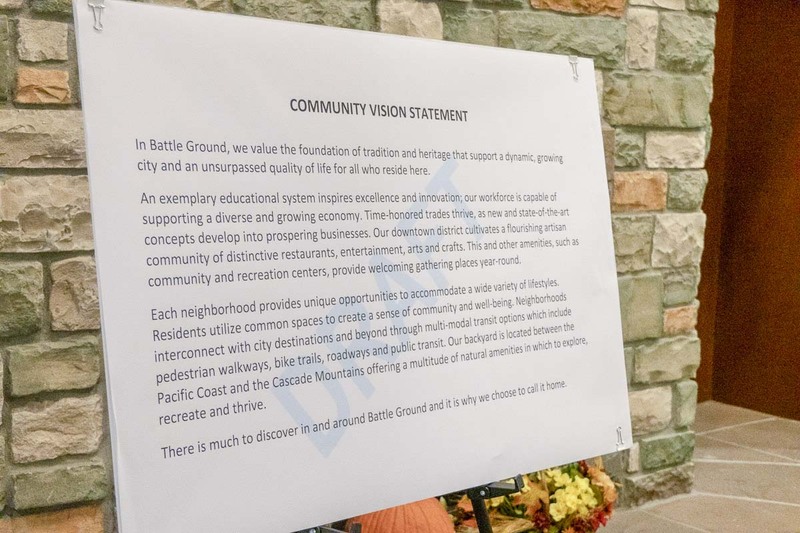 Battle Ground’s growth also faces challenges from the very nature that it is hoping to use as a selling point to businesses and future residents. “We’re getting to the point where it’s difficult to develop in Battle Ground because of that,” admits Erdman. Still, she says their hope is that wetland mitigation laws can be used to their advantage, creating natural open spaces in neighborhoods that end up as community gathering spots. Much of the feedback from citizens indicated they want more green space in Battle Ground. Not necessarily parks, but just green areas with walking trails intersecting them. Battle Ground’s Old Town has seen a major revitalization in the past five years, welcoming popular new businesses like Dungeon Donuts, Old Town Battle Grounds, and a number of vintage shops and unique restaurants. But many people in the survey said they wanted to see Old Town become more of a destination, similar to what Camas and Washougal have done. One idea way off in the future could be close Main Street through Old Town to vehicular traffic, but that would require major upgrades to SW and SE 1st Streets to the north and south, as well as added parking facilities in the area. We may get a clearer look at that concept in the next year or two as Battle Ground moves to phase two of their visioning project, which will include major land use and transportation studies. The Navigators will meet again next Tuesday to go over the results of the open house, before presenting a draft proposal and strategic plan to the Battle Ground City Council on December 3rd. You can read more about the city’s visioning project at http://www.battlegroundroadmap.org.